The way the Buddha used his fingers while preaching has been captured by sculptors, painters and carvers in their works. Kuala Lumpur, Malaysia -- Statues of Buddha, big or small, are always objects of admiration. The Buddhists revere these images, which symbolise peace and compassion. Not many people, however, know how to distinguish the mudras (hand gestures) of Buddha images. << Vitharka Kataka Mudra (Gesture of Intellectual Discussion) shows the right hand in the Vitharka Mudra form and the left hand in the Kataka Mudra fashion. This position is frequently seen in statues decorated with fresh flowers or other venerated objects. Mudras and asanas (seated postures) are employed in the yoga meditation practice of Hinduism. According to Wikipedia, each mudra has a specific quality and is part of Hindu iconography. With the spread of Buddhism, many mudra practices were absorbed into Hindu culture and common hand gestures can be seen in Hindu Buddhist iconography. Amarekha (a Pali word which translates as “the path to immortality”) is an exhibition of wood sculptures (neem and jak woods) which show the Buddha illustrating 29 mudras. Some 34 wood statues (each 0.76m high) are available for public viewing at the Buddhist Maha Vihara in Brickfields, Kuala Lumpur, in conjunction with the Wesak Day celebrations. Each of these statues took about 10 days to carve. The creative force behind them is Ven Dr Wilegoda Ariyadeva Thero, a scholar and researcher in Buddhist philosophy. He helmed the entire project, from the concept stage to the early sketches, and the final carvings. A team of craftsmen took six years to create the exhibits. The artists involved are Bandula Harischandra, Anura Srinath, R.H. Waidyaratne, K.T. Chandrasena and Susantha Kulawansa. Dr Ariyadeva, 57, chief monk of Sri Vijayarama Temple in Ambalangoda, southern Sri Lanka, is in KL for the exhibition. He is also senior lecturer and Dean of the Department of Pali and Buddhist studies at the University of Ruhuna in Matara, Sri Lanka. The exhibition was initiated by the Chief High Priest of Malaysia, Ven K. Sri Dhammaratana Nayaka Thera, who is also chief monk of Buddhist Maha Vihara. During a recent pilgrimage to Sri Lanka, Rev Dhammaratana stopped by Dr Ariyadeva’s temple to view the wood sculptures. This is the first time the exhibition has been unveiled outside Sri Lanka, and it’s possibly the last. After KL, the statues will be installed permanently at Dr Ariyadeva’s new Sri Vijayarama temple complex. Ordained as a monk at 13, Dr Ariyadeva has been with this temple for about 20 years. Four years ago, he took over as head after the chief monk’s demise. Taking the 34 wood sculptures on a “road show” in Colombo, Matara and Galle in Sri Lanka last year was the fulfilment of a vow. In January this year, the statues and a 2.1-metre seated Buddha wood sculpture – possibly the largest wood sculpture ever, which took seven months to carve – were taken to the ancient city of Anuradhapura, Sri Lanka’s first capital.The procession made a stop at the Presidential Palace in Colombo, where Sri Lanka president Mahinda Rajapaksa paid homage to the statues. << The Vairochana Mudra depicts the Buddha in a thrice bent posture, his right hand assumes the Abhaya Mudra (Gesture of Fearlessness) form while the left hand is slightly bent at the elbow and the palm faces outward. The largest Buddha wood statue features the Dharmacakra Mudra (Gesture of Preaching the Dharma). However, it has been enshrined at Dr Ariyadeva’s temple and is not among the exhibits in KL. Statues that feature this mudra depict Buddha delivering his first discourse, with two hands placed together in front of the breast, the right palm forward and the left palm upward or facing the breast. The index finger and the thumb of each hand form a circle. Some rare mudras include the Bhutadamana Mudra, Buddha Sramana Mudra, Vairochana Mudra, Vajrahumkara Mudra and Vitharka Kataka Mudra. Bhutadamana Mudra (Warding off Evil Gesture) shows the Buddha’s hands crossed at the wrist, with the right hand over the left hand and palms turned outwards. The third fingers are in contact with the thumbs, whilst the index and second fingers of both hands are erect, but slightly bent. The two little fingers touch back-to-back. The statue showing the Vairochana Mudra is a graceful piece of work. The head is slightly tilted to one direction while the hips are pointed in the opposite direction. The knees are slightly bent, giving the entire statue a Tivanka patima or thrice-bent posture. The right hand assumes the Abhaya Mudra (Gesture of Fearlessness). The left hand is slight bent at the elbow, with the palm facing outward. Only the index finger and the thumb point downwards, while the rest of the fingers are slightly curled up. This mudra can be seen in the Loya and Lunman cave temples in China, and the Gadaladeniya Temple in Sri Lanka. The Vajrahumkara Mudra features the Buddha with wrists crossed at the breast. The hands hold the vajra (thunderbolt) and ghanta (bell). The right hand crosses over the left at the wrist, with palms facing inwards towards the chest and (usually) bent over the heart, symbolising the union of method and wisdom. However, in this particular sculpture, both hands are clenched, to signify the unshakeable wisdom of the Buddha. The statue depicting the Vitharka Kataka Mudra (Gesture of Intellectual Discussion) shows the right hand in the Vitharka Mudra form and the left hand in the Kataka Mudra (holding the edge of the robe) fashion. This position is frequently seen in statues decorated with fresh flowers or other venerated objects. Two new mudras were created by Dr Ariyadeva. Lokavidu Mudra (Gesture of Realisation of the World) depicts the all-knowing quality of the Buddha. 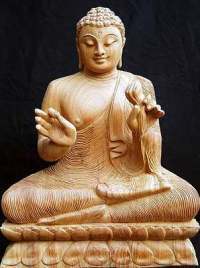 The right hand of the Buddha displays the Abhaya Mudra gesture. The left hand rests on the left thigh and a nelli fruit is in the left palm. This mudra conveys the message that life (or the universe), like the nelli fruit, is bitter-sweet. Nakhasika Mudra shows a small lump of clay in the Buddha’s nail. The size of the clay is symbolic of what the Buddha had taught, in relation to what he knew. The Buddha images also illustrate seven types of asanas such as Bhadrasana, Veerasana, Lalitasana, Makalasana, Padmasana and Misrasana. Dr Ariyadeva has also created two more Asana Pithas, which the Buddha used (as referred to in the Suttas). The very rare Buddha Sramana Mudra is based on a photo of a statue in Kabul, Afghanistan, which was destroyed not long ago. This mudra signifies an invitation by the Buddha to those who are qualified to gain wisdom. The Buddha is seated in the Lalitasana posture; his right foot appears to dangle over the edge of the pedestal and the left foot is tucked in the traditional manner. His right hand is lifted in line with the shoulder, the wrist is bent backwards and the fingers and the palm face upwards. The fingers point outward, away from the body and the left hand grasps the hem of the robe. He appears to be looking down from an elevated position. There is also a Buddha statue in Veerasana posture in which the right foot of the Buddha is always placed above the left foot facing upwards. The Buddha is depicted sitting on a throne with three lion figures. Lions are a symbol of bravery and the lions’ throne is an unusual pitha (seat). Another pitha shows the Buddha on a grass mat. The Amarekha exhibition also features all the postures of the Buddha. In Sri Lanka, Buddha statues are often depicted standing, sitting or lying down. The KL display has an exhibit showing the Buddha walking, a posture hardly seen in Sri Lanka, although it is common in Thailand. The only Reclining (or Sleeping) Buddha (neem wood) exhibit is also unique. It shows him resting on his folded double-layer robe. Normally, the Buddha is depicted lying on a platform. The Amarekha exhibition is open from today until May 15 (10am to 10pm) at Dewan Asoka, Wisma Dharma Cakra, of the Buddhist Maha Vihara in Brickfields, KL. Admission is free.